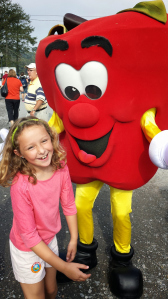 Apple Harvest Festival – It’s all about the Food | Children Are Our Future Now! By Stacey Fox – Every year by about late August, when early summer apples have hit the farm markets, the calendar goes in to countdown mode. Unlike most, I’m not counting down the days until school starts or the kickoff to football season. I’m looking forward to the National Apple Harvest Festival – perhaps my favorite event in Adams County. The festival is always the first two weekends in October. Each year it’s a gamble – will it be warm and sunny or a beautiful cool fall day. Either way it will be fun and family filled. My parents usually join us, at least for one trip. Some years my husband, daughter and I go twice because it’s so much fun, and we just don’t get our fill the first time.